2. Previous CPARs reports from VA Community Based Outpatient Centers verifying Advanced Filings capabilities to successfully plan, manage and complete a project of this scope. But the Miami VA Warehouse Project came with a set of unique storage system challenges. Typical storage systems projects begin with an inventory of what and how much is to be stored - followed by a design - then a parts list of equipment, a workflow timeline, and finally permitting requirements - which are all added together to get a cost. Instead of this conventional approach of analysis to design to price - the Miami VA bid package provided only a shopping list of parts to bid. It’s bid structure put the cart far in front of the horse - so the Advanced Filing team called on its experience with similar projects to alert the VA of the difficulties it could expect. Despite these warnings - the bid went out as a shopping list - and Advanced Filing won it. With the bid in hand - Advanced Filing's challenge was to build a storage system while at the same time dancing around unforeseen issues from the contract furniture dealer and the general contractor. Advanced Filing’s project management team decided the best course of action was to educate and advise the VA one step at a time while maintaining close coordination with its fellow tradesmen. The first step was to alert the VA of the requirement for permitting in Miami-Dade County since the bid did not have a line item for permitting sprinkler systems in the VA’s high pile storage rack assemblies. 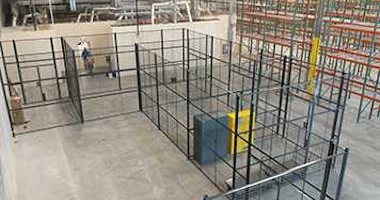 Next was the need to inventory existing to determine what and how much was to be stored in the high pile rack, wire mesh cages and lockers. Working backwards - Advanced Filing’s team inventoried the existing warehouse to calculate quantities and configuration of the pallet rack, pallet rack beams, wire mesh partition cages, forklift reach trucks, forklift reach truck charging stations, liquid safety cabinets and platform scales. Then Advanced Filing’s team created a CAD design that served dual purposes - first as a guide for installation AND second for the basis of submittal to Miami-Dade County for permitting. When the VA agreed to our design and timeline, the company began the process of ordering equipment. However, without a final furniture layout equipment location could not be determined - so Advanced Filing stored it and held back ordering additional equipment until the contract furniture dealer finalized his design. These delays stretched the contract completion date beyond its limit - not once but twice - nevertheless, Advanced Filing’s team requested and received contract modifications each time to keep funding in place. Maintaining close coordination with the general contractor and VA Logistics staff, Advanced Filing re-scheduled its installation timeline and completed the job. 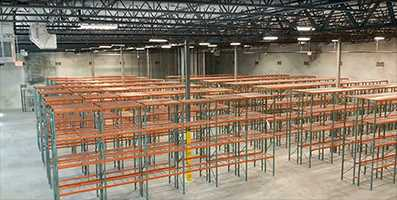 Although it ran more than 6 months behind schedule - Advanced Filing overcame every challenge to deliver a state of the art, fully permitted and equipped warehouse to the Miami VA.
For 30 years, Advanced Filing Systems has been praised for providing effective storage & filing systems to large organizations such as the US Navy, US Coast Guard & US Postal Service. Our mission is to reduce the footprint of your physical space with innovative storage solutions, products and services.